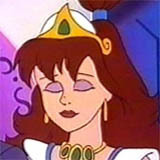 Princess Lana, the character voiced by Venus Terzo, took over as the ruler of Videoland after her father, King Charles, disappeared. She wishes for peace more than anything else and is too trusting of others, even Mother Brain, if there is a chance of peace. This leads to problems in multiple instances.